Roomie Terrace & Hostel i Cordoba, Argentina : Boka nu! 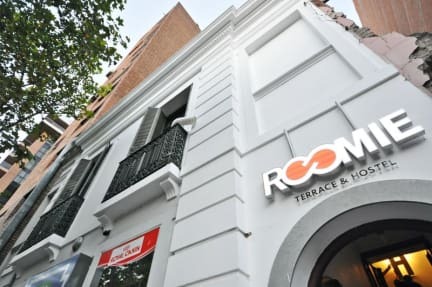 Roomie Terrace & Hostel is a new boutique Hostel designed and created to make your stay extremely comfortable. Perfect if you are looking for harmony and privacy in the heart of Nueva Córdoba. It offers a high quality service, with capacity for 20 passengers that we begin to see in the design of its raised rooms to provide absolute privacy. Each bed has a single light, plug and spacious place. The AA and heating is also provided in each of the rooms. Our common areas are designed for excellent socialization, as well as offering different forms of entertainment in them. Every morning you can enjoy our breakfast, which is served in the kitchen until 11 am. All our staff will be happy to advise our guests on any itinerary, transportation, restaurants, shops, bars, parties and any other requirements. 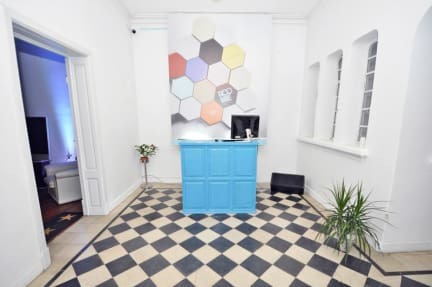 Roomie Terrace & Hostel is located in the middle of golden cultural league in Nueva Córdoba, thought purely and exclusively to make your stay unique. Close to the University City, surrounded by the best museums of the city of Córdoba; steps away from Parque Sarmiento, one of the most beautiful green spaces in the city. Next to the Spanish Embassy, in front of the Ferreyra Palace; Close to the Caraffa Museum, the Museum of Natural Sciences, the Dionisi Museum. A few steps away you will find shops, bars and restaurants. Served by their owners, concerned to make your stay comfortable and the best of your trip.